You are an Aries if you were born between March 21st and April 20th. 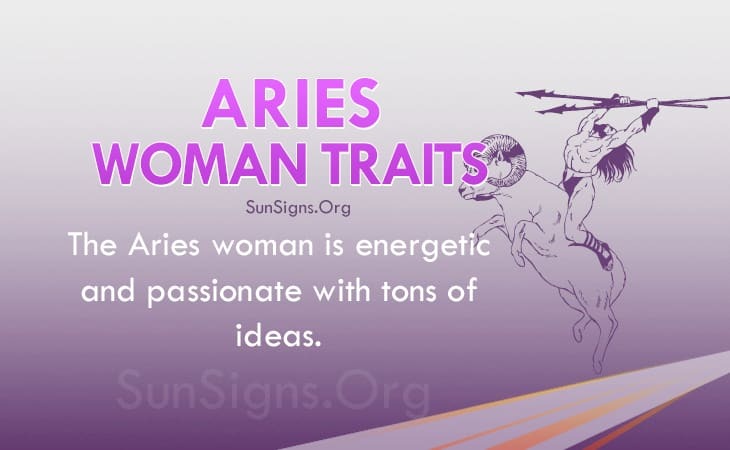 In a couple of words, the Aries woman personality is energetic and passionate. You will rarely find an Aries woman who is worn out or that has no energy to her. Aries women live to do things. They won’t want to settle for sitting on the sofa all day. The Aries woman personality traits show she would much rather get up and do something with her day. The Aries lady is likely to wake up early in the morning in her older years to get her day started. She wants to be productive and get her goals done, and she can’t rightly do this if she is sitting around in bed all day. The Aries woman traits needs her independence if she is to be happy. An Aries woman isn’t one to be tied down. If she is committed to anything, it’s going to be her career. While the Aries woman doesn’t love the idea of saving money, she will at times because she knows that it’s always a good idea to have a financial safety net in place. The Aries female will want a job that she can see herself leading in. The Aries woman characteristics show she won’t want to settle for a simple retail or fast-food job. She would much rather have a job that put her in a position of power. To put it simply, the Aries woman wants to be the boss. This idea is especially attractive to the Arian because when you’re the boss you get to make the rules. She doesn’t want to be told what to do by superiors, she wants to be the superior who tells people what to do. Also, a job with a high level of responsibility will pay well. And with a decent paycheck every couple of weeks the Aries woman doesn’t need to worry about depending on anyone else for money. The Aries woman personality traits show she is loyal to her friends and family. Although she may not want to be committed to a romantic relationship, she doesn’t mind being committed to her friends and family. Part of the reason that the Aries woman works so hard is to impress the people that she cares about. While the Aries girl does not need approval to do what she wants, it can still help to boost her self-esteem. The Aries woman’s self-esteem is rarely higher than when her family is proud of her. But this also adds to the Aries woman’s exciting lifestyle. The Aries woman traits she is one to take chances. She’s not afraid of a little risk in life. In fact, she doesn’t see the point of life without a little risk. The Aries woman personality doesn’t want to be with someone who can’t match her enthusiasm for life. She will look for a partner who can be as intense and passionate as she is. The Aries woman characteristics shows she is more likely to have flings and one night stands than some of the other star signs. The Ram lady will want excitement in her life, more than she needs commitment. Anyone who gets into a romantic relationship with an Aries woman should be prepared for a wild ride. The Aries woman is likely to take her partner on adventure-like dates and be wild in the bedroom as well.